There seemed to be some confusion between the drag racing forum and the Fastest Times List forum. Some guys thought that the Fastest Times List forum was for those who were super fast and not for a stock car that did well. some of those guys were posting times in the Drag Racing forum, in which was causing the confusing on where to post your story about your time slip etc. Well, I have now moved the Fastest Times List forum from "Other SRT-4 Discussion" to "SRT-4 Racing Discussion" to keep everything on topic and neat. I have renamed the "Fastest Times List" forum to "Time Slip Database" forum. So please Post your time slips in this forum and keep Drag Racing forum to just hel in general like, set ups, tires, suspension that helps with launches etc..
All Times should go into the Time Slip Database forum! Powered by Mopar Stage 1/3 Hybrid. Put it on a 200' extension cord and throw it in the lake! It will make LOTS of sound! 13.647 @105,not in the 12s but will be soon ! of you have been Alive ! Last edited by maxfastest; 09-12-2006 at 07:50 PM. Second time at the track. Only had my license for 3 months. Just turned 16. 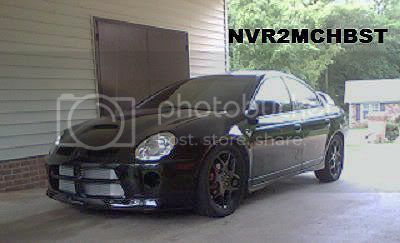 I have Mopar Stage 2 and street tires. dont have all the information just the important stuff..
cant wait to go to the new mods.. I didnt have the exhaust and i only had 11psi..i was real pissed, but i havent run it this yr.
1/4 mile- 14.05 with a severe head wind. '05 Stock everything including stock tires. Last edited by Powellds; 05-10-2007 at 01:59 AM. 11.79 @ 118.53 S3 + bolt-on car! BEST TRAP [email protected] on street tires. R.I.P. Blue. One of the best cars I've ever owned!!! Last edited by bluebeast; 07-26-2007 at 06:45 PM.